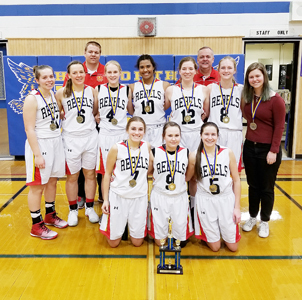 The W.R. Myers Rebels varsity girls basketball team was able to withstand a furious fourth-quarter comeback by host Lindsay Thurber Raiders from Sherwood Park to take home the gold medal in tournament play over the weekend. The Raiders were able to go on a 19-4 run in the fourth quarter, but the Rebels’ big previous lead made sure it was not enough in a 51-47 victory. Kitawna Sparks had a huge game with the double-double of 27 points and 15 rebounds. Austen Robbins had 14. The Rebels opening game of its winning run had W.R. Myers dominating its opposition with a 79-34 victory over Lloydminster on Friday. “We took control right from the start. All the girls got on the score board. Alex Haller had a great game, taking the ball to the hole and converting,” said Bullock. Haller led Rebels scoring with 20 points and Robbins added 15. Sparks grabbed 10 rebounds. The Rebels had to fight the home-court advantage as well with Salisbury from Sherwood Park in its semifinal and was able to do so successfully in a 74-55 win thanks to a big 28-point first quarter. “Our press worked very well and we led 28-13 to end the first quarter. We held our lead and denied any runs they tried to have,” said Bullock. Sparks poured in 21 points with Robbins and Haller adding 19 and 14 points respectively. Lauren Steed chipped in 11 points. The Rebels hosted Catholic Central Cougars on Monday and hit the road today with a game against LCI Clippers. The team battles Cardston Cougars on the road on Jan. 26 and then hosts Chinook Coyotes at 3 p.m. on Jan. 27.